Sergiyev Posad is the closest to Moscow of all the ancient towns on the Golden Ring. Sergiyev Posad is the closest town to Moscow that features on the so-called Golden Ring tourist route. It is within an hour’s drive of the Russian capital (or a little more if you travel by bus). Just as in most old Russian towns, the road to Sergiyev Posad is also historically its central street. 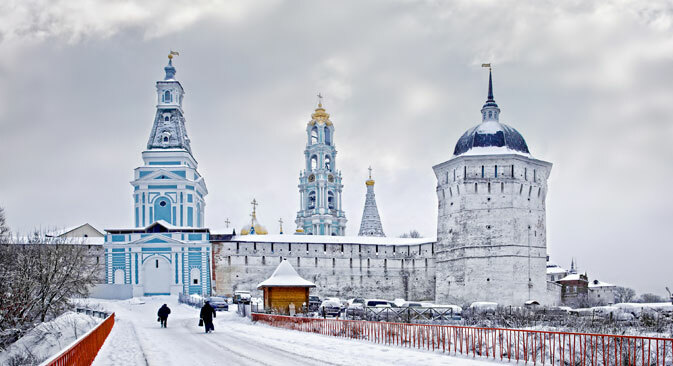 The town’s cultural center is the Trinity Lavra (monastery) of St. Sergius — an ancient monastery surrounded by stone walls, with impressive watchtowers around its perimeter. In the old days, monasteries primarily fulfilled the role of fortresses, and monks made excellent warriors. The Cathedral of All Saints at the center of the monastery, crowned with beautiful blue cupolas, is now closed for restoration work. The entire area of the monastery is paved with stone blocks, with more than ten different paving techniques used. Walking around on stone block pavement is nice, unless you are wearing high heels. It would be advisable not to wear high heels anywhere when touring Russia's ancient cities. The Trinity Lavra of St. Sergius is an attraction not only for tourists, but also for pilgrims. While the former are drawn to it as a unique historical monument and a UNESCO World Heritage site, the latter worship it as a holy place. Tourists and pilgrims alike have free access to all functioning churches and chapels at the Lavra, and some of them attract so many people that visitors have to wait in lines to be admitted. The longest line is usually at the Trinity Cathedral, where visitors can see the works of the famous painter of orthodox icons, Andrei Rublev. “We have come here as pilgrims, to venerate the shrines. We come from the South, from the Krasnodar region. We have not looked around the town itself, but we are planning to have a walk through the town later today,” said Yegor, a young man in a Cossack uniform. He and his Cossack friends came to Sergiyev Posad on a bus tour. Moscow buses 338 to Sergiyev Posad depart every 10-15 minutes from VDNKh metro station. Commuter trains run to Sergiyev Posad (as well as to Balakirevo and Aleksandrov, which will also get you to Sergiyev Posad), departing once every 10-30 minutes from Yaroslavsky Railway Station. If you come out through the Lavra’s main gate, you step onto Krasnogorskaya Square. Take your time and walk from here, along the monastery’s outer wall, to the monument of St. Sergius of Radonezh, who founded the town back in 1337. With the view that opens from this square, you will be able to appreciate the difference between the maintenance and restoration work on buildings that date back 300-400 years and the neglect of structures built merely half a century ago. Right across the road from the Lavra, the former Mir cinema lies in a state of total dilapidation. Its façade, an example of the Soviet architectural style of the second half of the 20th century, is dominated by a large globe and four enormous female figures symbolizing the different peoples of the Soviet Union — all wrapped in celluloid tape. It can only be hoped that the day will come for this building, now half in ruins and fenced off, to be renovated also. As it is often the case in Russia, churches and religious sites go hand-in-hand with Soviet monuments. There is a noteworthy war memorial in the Pafnuty Gardens, just over 650 feet away from the Lavra, with an eternal flame commemorating all the citizens of Sergiyev Posad who died in World War II. Nearby, you can see the Cathedral of the Presentation of the Virgin Mary, built in the 16th century and unduly overlooked. If you come to Sergiyev Posad, you should not miss visiting the Gethsemane-Chernigov Shrine. Even though it is located on the outskirts of town, it is actually still within walking distance or accessible by city transportation. It will take you a 40- or 50-minute walk down Vifanskaya Street to get there from the Lavra. It is a functioning monastery, but its major attraction is the cave monastery 23 feet below its major cathedral. The cave monastery dates back to the middle of the 19th century, when one particular monk thought there was not enough seclusion in the cloister and created a monastery within the monastery. He personally dug out the small cell where he lived and prayed. His example inspired other monks, who also dug underground prayer nooks for themselves. This became the main condition for accepting new members to the cave friary: that the monk would dig out an abode for himself. Some cells are as small as 16 square feet. In time, monks added new passages and rooms to the caves. They even have an underground cathedral where services are now held twice a week. Tourists are only allowed to go down in groups led by a guide — usually, a local monk. Groups of up to 10 people assemble upstairs in the cathedral above; just inquire with one of the women selling candles in the church shop. If you really intend to go down to the cave cathedral, make sure you have an empty water bottle on you (if you do not have one, buy one in the shop above): as they expanded their underground premises, monks tapped an underground spring. You will be able to collect holy water from the spring, free of charge. Modern Sergiyev Posad is an industrial town, and home to various machine-building, electrical-engineering and metal-processing plants, among others. It is also a district center with a population of some 250,000 people. Historically, the town was famous for the toys it produced. With its history of doll-making going back to the 16th century, the town now accommodates Russia's only Institute of Toy Making, as well as a Toy Museum that features a collection illustrating the entire evolution of dolls. Although the town has hotels, they do not stand out as noticeably as in other cities on the Golden Ring. Its proximity to Moscow has turned Sergiyev Posad into a kind of a transfer point for tourists: they usually spend the day here and, either, proceed to Yaroslavl, or, go back to Moscow. It is a very convenient place to travel to, if you have a free day in Moscow.